A star party was held Saturday, July 21st at 9:30 pm. We had terrific views of Venus, Jupiter, Saturn and the Moon. Check this web page for the latest information about future star parties. Cancellations will be announced here no later than 6:00 pm on the day of the event. For questions, call me on my cell phone 206-794-6928. 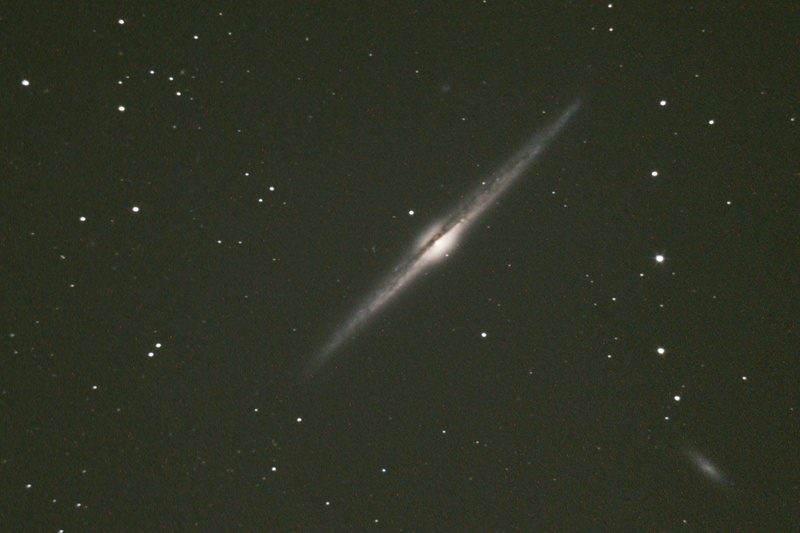 I captured this galaxy the night of May 11-12, 2018. NGC 4565 is a spiral galaxy more luminous than the Andromeda Galaxy but roughly twenty times farther away (30-50 million light-years). We see it edge-on, giving it a needle-like appearance. In the lower right corner of the frame there is another spiral galaxy, NGC 4562. This image is the result of combining 63 4-minute exposures for a total exposure time of 4 hr 12 min. NGC 6946, the ‘Fireworks Galaxy’ has been the site of 10 supernovae recorded over the past 100 years. It is a spiral galaxy 22.5 million light-years away, located between the constellations Cepheus and Cygnus. This image is the result of stacking 61 3-minute exposures with a Canon 6D camera on a Takahashi Mewlon 250 telescope at f/12. 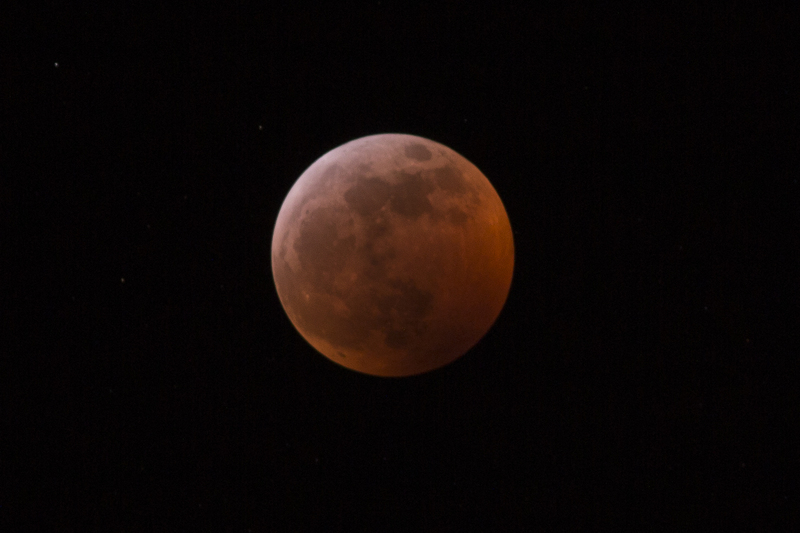 Recorded the night of May 7-8, 2018. Messier 81, also known as NGC 3031 is a spiral galaxy. It is the largest of a group of 34 galaxies in Ursa Major, including its near neighbor M82, ‘merely’ 300,ooo light-years away. 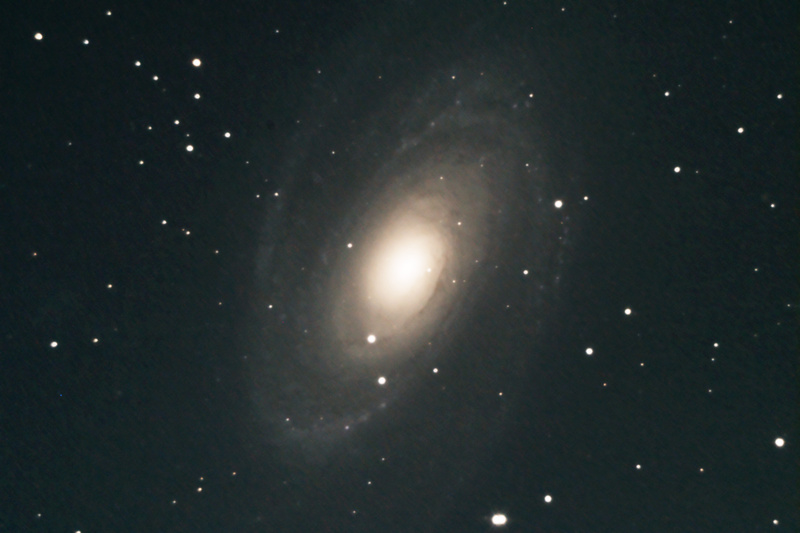 Some scientists believe that the high rate of star formation in M82 was caused by a close encounter with M81 some 500 million years ago which stirred up a lot of dust and gas in the neighboring galaxy. 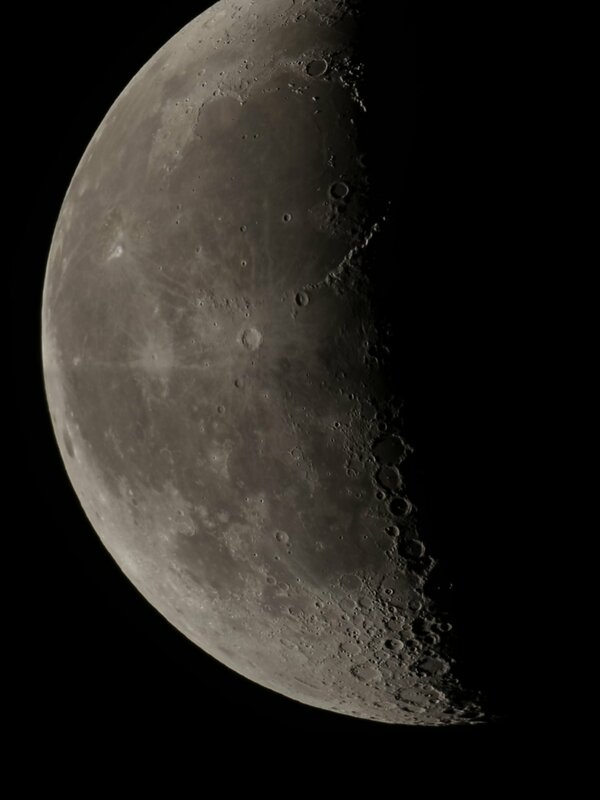 This image was taken April 26, 2018 with a Canon 6D camera attached to a Takahashi Mewlon 250 telescope at f/12. Fifty-three frames of 2-minute exposures were combined, for a total exposure of 1 hr 46 minutes. 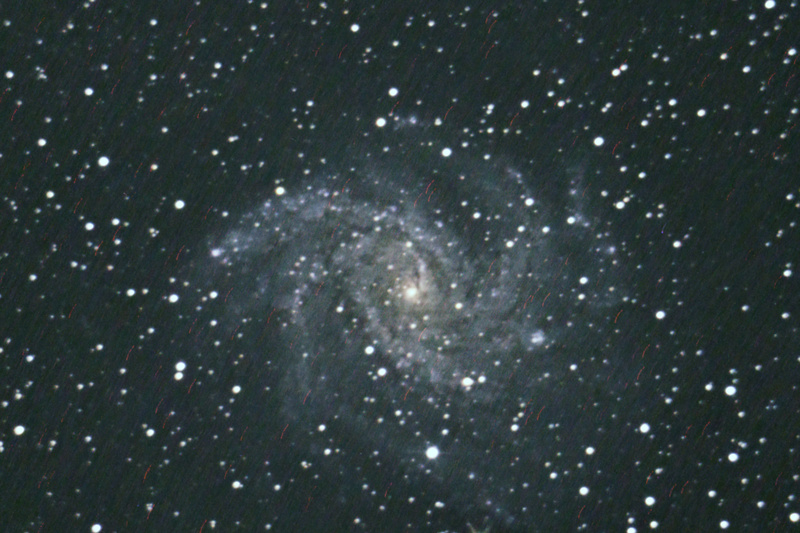 DeepSkyStacker v 3.3.2 and Photoshop CC with Astronomy Tools from ProDigital Software were used to enhance the structure of the spiral arms. M82, also known as NGC 3034 in the constellation Ursa Major is about 12 million light-years away. M82 is a prototypical example of a starburst galaxy, characterized by an exceptionally high rate of star formation. This image was created by combining two hundred 2-minute exposures taken the night of April 25-26, 2018. The camera was a Canon 6D, mounted on a Takahashi Mewlon 250 at f/12. This 9-minute video describes our family’s trips around the world to witness solar eclipses, with the culmination August 21st, 2017 of our experiences in Prairie City, a small town in eastern Oregon. We viewed the solar eclipse of August 21, 2017 from Prairie City, Oregon, about 5 miles from the centerline of the path of totality. 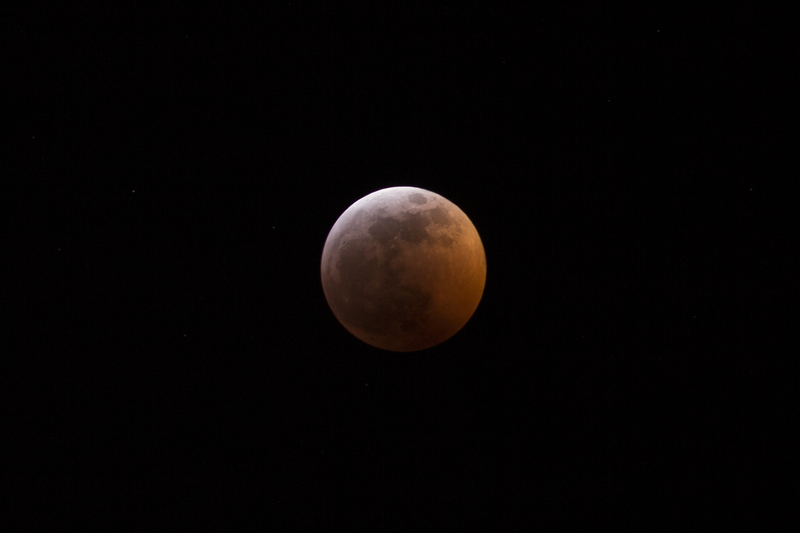 This video includes a time-lapse sequence of the partial phases (about an hour-and-a-quarter real time into 20 seconds) and still frames of totality ( which lasted 2 minutes 9 seconds). Sunspots are visible during the partial eclipse phases. 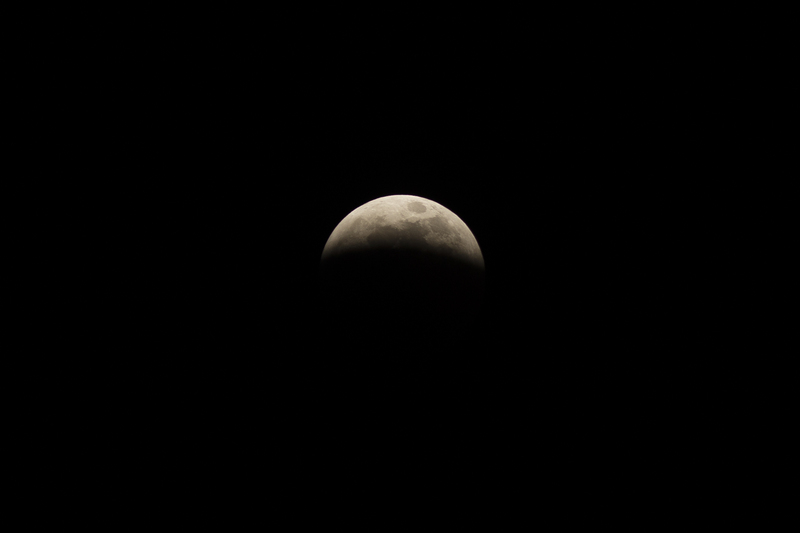 The diamond ring and Baily’s Beads are visible just before totality. The corona and solar prominences can be seen during totality, and the bright star Regulus in the constellation Leo is visible to the left. 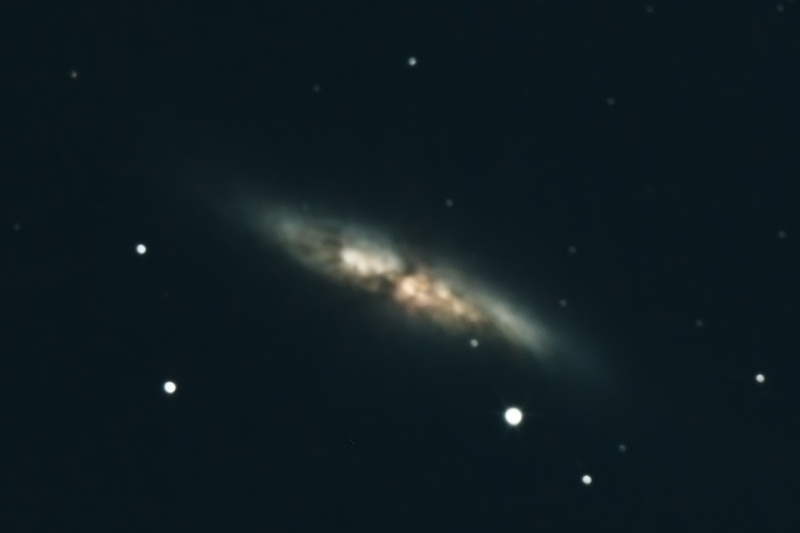 Images were captured using a Canon EOS 6D camera attached to a Takahashi FSQ-106 telescope on an iOptron CEM25 mount. The camera was controlled by a Windows 10 PC running Eclipse Orchestrator Pro v. 3.7.2017/06/14 from Moonglow Technologies. Accurate timing and geographic location information were obtained using a Garmin GPS 18x USB device. The computer was connected to the camera using two cables: A camera interface cable, IFC-200U from Canon and a DSUSB shutter control adaptor from Shoestring Astronomy. A solar filter from Orion Telescopes & Binoculars was fitted over the aperture of the telescope during the partial phases. On a rafting trip through the Grand Canyon in March-April, 2016, I captured images of the sky that I assembled into time-lapse videos. On clear nights, I set up my camera on a tripod and recorded two photographs each minute for several hours through the night. Audio was added later. Canyon walls were illuminated by moonlight when the moon was up. The rapid streaks you see are airplanes flying over the canyon. 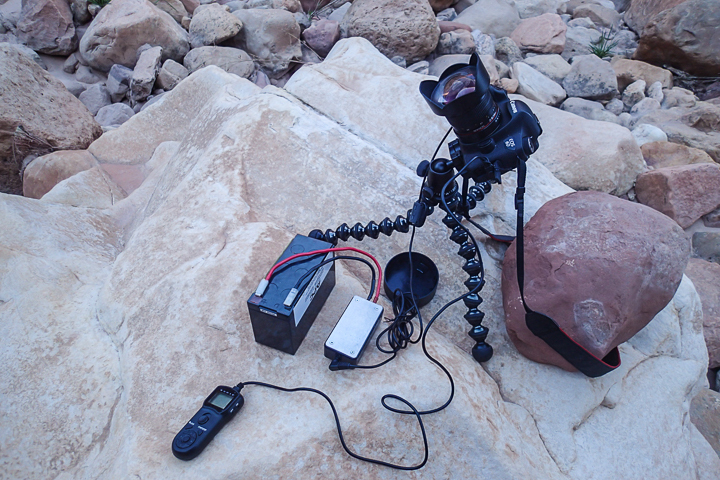 See the Equipment for Time-lapse Imaging page to see details about camera and power supply. For highlights of our rafting trip, check out the video Running the Colorado on YouTube. In the early morning hours of Oct 5, just before closing down the observatory, I decided to try capturing the crescent moon while the seeing conditions were still good. Here is the result. Click to open a full-size image. This image is a mosaic of three images: northern, mid-section and southern, each of which was created from several hundred frames of a 60-second video clip. Frames were sorted by quality, aligned and combined using Autostakkert!2 software by Emil Kraaikamp of the Netherlands.